Any fan of the famous feline will enjoy this 20" Hello Kitty Girl's BMX Bike. It comes equipped with a handlebar bag, streamers and spoke art for a stylish look. The Hello Kitty ride-on toy has plastic pedals that grip shoes for safety. The quick-release alloy seat can be adjusted for the ideal height for your child. The sturdy steel frame is durable and long lasting. It is equipped with a coaster brake, along with front and rear caliper brake, making stopping a breeze. This model does not come with training wheels, so it is ideal for a youngster who has a little experience. This girls' ride-on toy has knobby tires that are suitable for sidewalks and park trails. Your child will love the bright accents and shiny frills that come with this two-wheeler. 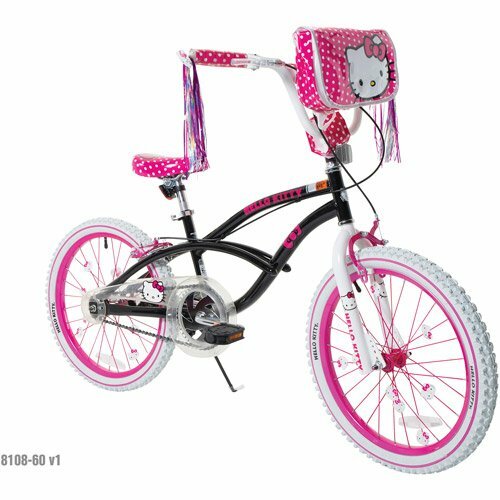 This 20" Hello Kitty Girl's BMX Bike makes a fine gift for your active youngster. Weighs 33.85 lbs. Assembled dimensions: 55" x 26.50" x 36"